Youth Adventures participants will have new helmets to wear when they come out to the State and National Park to ride this year. CORBA has purchased twenty new helmets for this program from Bell Sports. CORBA has purchased and built a new storage building to house all the equipment and is creating a completely outfitted workshop with tools so all the bikes can be maintained and repaired. If you are interested in volunteering with Youth Adventures, mentoring young people and having a lot fun, check the Youth Adventures web page. Members of CORBA-PV, a regional committee of CORBA in Palos Verdes, and CORBA, worked diligently with the Palos Verdes Peninsula Land Conservancy building a bridge, putting in water bars, and brushing the trails in Forrestal on Saturday, February 24. Kurt Loheit designed the bridge and oversaw its construction on the Mariposa Trail. After trail work projects were completed Troy Braswell lead a celebratory ride on the re-opened trails which are Flying Mane, Mariposa, Pirate and Cristo Que Viento. 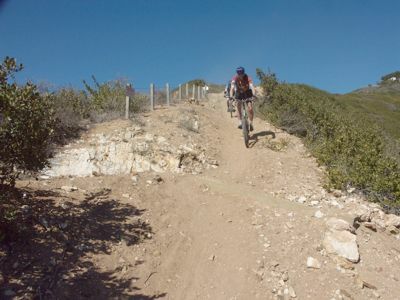 The trails have been re-opened to bikes on a trial basis by the Rancho Palos Verdes City Council. A map of these trails is available at: http://mtbpv.org/ . Click on "map" in the paragraph below the photo of the bridge building crew. The IMBA Trail Crew will be coming to the Angeles Forest to work on the Middle Sam Merrill Trail. There will be a slide show on Friday 3/23 in Pasadena. Then on Saturday 3/24 there will be a classroom session in the morning and then trail maintenance on the Middle Merrill in the afternoon. On Sunday 3/25 there will be a ride. Check back later for more details. For those of you in Santa Monica Mountains we will be working on the trail off of Reino Road in Thousand Oaks that we started building with the IMBA Trail Crew in 2005. This will be a joint trail work day with the SMMTC. In the 15 years that I've been teaching the free CORBA Introduction To Mountain Bike Skills Class, I have seen thousands of novice riders overcome fears, and advanced riders improve upon their techniques. I can honestly say that everyone that has attended a class has learned something to improve their off-road riding skills. Even though the class is designed for novice riders, we always recognize the more advanced riders, and make sure we watch for any areas that can be improved upon. You'd be surprised how many "experienced" riders have developed bad habits that prohibit them from getting better. We can spot small flaws that with just a minor adjustment can make a major difference. With spring upon us, now's the perfect time to come out for a little technique tune-up. To ALL members of the Mountain Bike Unit (MBU) going through training, please consider attending the skills class. It will help you in aiding the park users you will come into contact with. Also, those MBU members who volunteer for Youth Adventures will find the class invaluable. Remember, no matter what your skill level or how many years you've been riding, you can always improve your mountain biking technique. Hey, if professionals have coaches, why shouldn't you?